Giovanni Pico della Mirandola (February 24, 1463 – November 17, 1494) was an Italian Renaissance humanist philosopher and scholar, whose short influential life was brilliant, peripatetic, adventurous, and almost theatrical in its eventfulness and intensity. He is most celebrated for the events of 1486, when at the age of 23, he proposed to defend nine hundred theses on religion, philosophy, natural philosophy and magic against all comers, for which he wrote the famous Oration on the Dignity of Man which has been called the "Manifesto of the Renaissance," and a key text of Renaissance humanism. During the Middle Ages, when God and the church were in the most exalted position, it was considered almost impossible to declare “the Dignity of Man,” the concept which became the starting point of Renaissance humanism. Pico della Mirandola was one of the first to resurrect the humanism of ancient Greek philosophy. He also believed that every religion shares some elements of truth, and set out to create a synthesis of several great religions and major philosophies including those of Plato and Aristotle. Pico and his teacher Marsilio Ficino are credited with initiating the resurrection of human dignity and the concept of free will at the beginning of the Renaissance. Pico said that free will, if properly directed, can make men into divine beings, or if misdirected, into evil beings. Pico della Mirandola was a younger son of the family of the counts of Mirandola and Concordia. Pico’s father, Giovanni Francesco Pico, was prince and feudal lord of a small region in the province of Emilia-Romagna. His father provided humanistic education at home for Pico, a precocious child with an amazing memory. He was schooled in Latin, and possibly Greek, at a very early age. Intended for the church by his mother, he was named a papal protonotary at the age of ten and in 1477 he went to Bologna to study canon law. Upon the sudden death of his mother two years later, Pico renounced canon law and began to study philosophy at the University of Ferrara. During a brief trip to Florence, he met Angelo Poliziano, the courtly poet Girolamo Benivieni, and probably the young Dominican monk Savonarola. He would be very close friends with all three, including the ascetic and violently anti-humanist Savonarola, for the rest of his life. From 1480 to 1482, he continued his studies at the University of Padua, a major center of Aristotelianism in Italy. Already proficient in Latin and Greek, he studied Hebrew and Arabic in Padua with Elia del Medigo, a Jewish Averroist, and also read Aramaic manuscripts with him. Del Medigo also translated Judaic manuscripts from Hebrew into Latin for Pico, as he would continue to do for a number of years. Pico also wrote sonnets in Padua—both in Latin and in Italian—which he later destroyed at the end of his life. He spent the next four years either at home, or visiting humanist centers in Italy and in 1485, he traveled to the University of Paris, the most important center for Scholastic philosophy and theology in Europe and a hotbed of secular Averroism. It was probably in Paris that Pico began his 900 Theses and conceived the idea of defending them in a public debate. In 1484, he returned to Florence and met Lorenzo de' Medici and Ficino, on the very day that Ficino, who was a leading Platonist philosopher of the Renaissance, completed his translations of the works of Plato from Greek into Latin under Lorenzo’s enthusiastic patronage. Both were charmed by Pico, and until his death Lorenzo continued to support and protect Pico during difficult times. Without Lorenzo, it is doubtful that Pico’s work would have survived. Pico left for Rome, with the intention of publishing his 900 Theses and setting up a “Congress” of scholars from all over Europe to debate them. On the way, stopping in Arezzo, he became embroiled in a love affair with the wife of one of Lorenzo de' Medici’s cousins which almost cost him his life. Pico attempted to run off with the woman, but he was caught, wounded and thrown into prison by her husband. He was released only upon the intervention of Lorenzo himself. This incident is representative of Pico's often audacious temperament and of the loyalty and affection he nevertheless inspired in his friends. Pico spent several months in Perugia and nearby Fratta, recovering from his injuries. It was there, as he wrote to Ficino, that "divine Providence […] caused certain books to fall into my hands. They are Chaldean books […] of Esdras, of Zoroaster and of Melchior, oracles of the magi, which contain a brief and dry interpretation of Chaldean philosophy, but full of mystery." It was also in Perugia that Pico was introduced to the mystical Hebrew Kabbalah, which fascinated him, as did the late Classical Hermetic writers, such as Hermes Trismegistus. At that time, the Kabbalah and the Hermetica were thought to be as ancient as the Old Testament, and he accorded them an almost scriptural status. It was always Pico's method to circle completely around a topic and look at it from many possible angles, in order to derive the truest possible vision of the thing itself. Syncretism, for Pico, was seeing the same absolute from many different points of view, an unusually modern approach. Pico became the first Christian scholar to use the theory of Kabbala in support of Christian thought. Pico based his ideas chiefly on Plato, as did his teacher, Marsilio Ficino, but Pico retained a deep respect for Aristotle. Although he was a product of the studia humanitatis, Pico was constitutionally an eclectic, and in some respects he represented a reaction against the exaggerations of pure humanism, defending what he believed to be the best of the medieval and Islamic commentators (see Averroes, Avicenna) on Aristotle in a famous long letter to Ermolao Barbaro in 1485. It was Pico’s aim to reconcile the schools of Plato and Aristotle, believing that they used different words to express the same concepts. It was perhaps for this reason that his friends called him "Princeps Concordiae, or "Prince of Harmony" (a pun on Prince of Concordia, one of his family’s holdings). Similarly, Pico believed a scholar should also study Hebrew and Talmudic sources, and the Hermetics, because he believed they represented the same view of God as the Old Testament, but in different words. He finished his Oration on the Dignity of Man to accompany his 900 Theses and traveled to Rome to carry out his plan to defend them. He had them published in December 1486 (Conclusiones philosophicae, cabalasticae et theologicae, Rome, 1486) and offered to pay the expenses of any scholars who came to Rome to debate them publicly. In February 1487, Pope Innocent VIII halted the proposed debate, and established a commission to review the orthodoxy of the Theses. Although Pico answered the charges against them, thirteen of the Theses were condemned. Pico agreed in writing to retract them, but he did not change his mind about their validity, and proceeded to write an Apologia ("Apologia J. Pico Mirandolani, Concordiae comitis" published in 1489) defending them, dedicated to Lorenzo. When the pope was apprised of the circulation of this manuscript, he set up an inquisitorial tribunal, forcing Pico to renounce the Apologia as well, a condition which he also agreed to. Nevertheless, the pope declared Pico’s Theses unorthodox, saying they were "in part heretical, in part the flower of heresy; several are scandalous and offensive to pious ears; most do nothing but reproduce the errors of pagan philosophers…others are capable of inflaming the impertinence of the Jews; a number of them, finally, under the pretext of "natural philosophy," favor arts that are enemies to the Catholic faith and to the human race." One of Pico’s detractors maintained that "Kabbala" was the name of an impious writer against Jesus Christ. Pico fled to France in 1488, where he was arrested by Philippe de Savoie, at the demand of the papal nuncios, and imprisoned at Vincennes. Through the intercession of several Italian princes—all instigated by Lorenzo—King Charles VIII had him released, and the pope was persuaded to allow Pico to move to Florence and to live under Lorenzo’s protection. But he was not cleared of the papal censures and restrictions until 1493, after the accession of Pope Alexander VI (Rodrigo Borgia) to the papacy. Pico was deeply shaken by the experience. He reconciled with Savonarola, who remained a dear friend, and it was at Pico’s persuasion that Lorenzo invited Savonarola to Florence. Pico, however, never renounced his syncretist convictions. He settled in a villa near Fiesole prepared for him by Lorenzo, where he wrote and published the Heptaplus id est de Dei creatoris opere (1489) and De Ente et Uno (1491). It was here that he also wrote his other most celebrated work, the Disputationes adversus astrologiam divinicatrium, which was not published until after his death. In it, Pico acidly condemned the practices of the astrologers of his day, and shredded the intellectual basis of astrology itself. Pico was interested in high magic, that enhanced man's dignity and strengthened his will, and there was no room in such a concept for the determinism of the stars. 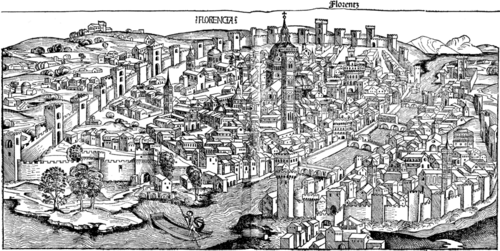 After the death of Lorenzo de' Medici in 1492, Pico moved to Ferrara, although he continued to visit Florence, where political instability gave rise to the increasing influence of Savonarola, whose reactionary opposition to Renaissance expansion and style had already brought about conflict with the Medici family (they eventually were expelled from Florence), and would lead to wholesale destruction of books and paintings. 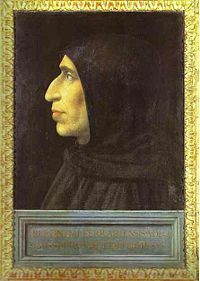 Nevertheless, Pico became a follower of Savonarola, destroying his own poetry and giving away his fortune, with the determination of becoming a monk. However, he never made the final commitment. Our dear Pico left us on the same day that Charles VIII was entering Florence, and the tears of men of letters compensated for the joy of the people. Without the light brought by the king of France, Florence might perhaps have never seen a more somber day than that which extinguished Mirandola’s light. When Pico came to Florence in 1484 and met his future benefactor, Lorenzo, it was less than 50 years since the first seeds of the Renaissance had been planted in Florence. Under threat from the Ottomans, the Byzantine Empire had approached Western Europe, and in 1439 Byzantine scholars had come to Italy for the Council of Florence. These scholars had a significant impact on the intellectual community of the West. Georgius Gemistos Plethon (1355-1452), a Byzantine scholar, gave a lecture about Plato to the Council of Florence. The financial sponsor of the Council, Cosimo de' Medici (the first of the Medici dynasty to rule Florence during the Renaissance) was impressed by his lecture and asked him to remain in Florence. Cosimo decided to establish a new Academica Platonica (Platonic Academy). He discovered the talents of Marsilio Ficino, the son of his personal physician, and gave him a villa, situated at Careggi, outside Florence, for the new Platonic Academy. Ficino later became a leading figure of the Italian Renaissance and the academy became one of the foremost intellectual centers, attracting many eminent scholars, especially humanists. Ficino translated a number of Plato’s classic works from Greek to Latin. Throughout the Middle Ages, the philosophy of Aristotle had influenced scholasticism, and especially Thomas Aquinas. In reaction to the highly systematic philosophy of Aristotle, many Renaissance humanists were attracted to Plato, whose philosophy, in comparison, was literary. The new Academica Platonica (Platonic Academy) in Florence rode the current of the time, in which humanists wanted ardently to study the theory of Plato. The age of the dictates of Aristotle had ended, and the age of Renaissance humanism had begun. The revival of Plato was not a simple restoration of pure Platonism, but Neoplatonism, which exhibited a tendency towards religious mysticism and had been easternized in the Hellenistic world. 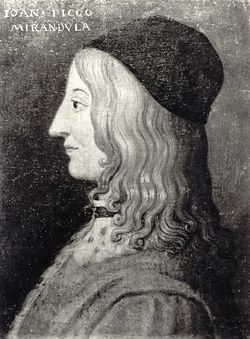 In 1483 (or 1484) young Pico della Mirandola was introduced to Ficino, now almost fifty years old, of the new “Academica Platonica” (Platonic Academy) in Florence. At that time the academy’s patron was Lorenzo de' Medici, the grandson of Cosimo. Ficino was impressed by the learning of young Pico della Mirandola, who soon entered the academy and became a friend of Lorenzo. Pico was deeply influenced by the Platonism of Florence and became a leading scholar in this circle. In the Platonic academic atmosphere of the academy, Pico started work on a synthesis of Plato and Aristotle. In order to accomplish this, Pico again went to study in 1485-1486 at the University of Paris, the center of Aristotelian scholasticism. Pico’s original plan to reconcile Plato and Aristotle was elevated to a grand synthesis of religious wisdom which would not only deepen recognition of the truth of Christianity, but also serve as an apologetic defense against non-Christians. For this purpose, Pico became the first Christian scholar to master the Jewish mystical theology of Kabbalah. He attempted to develop a form of syncretism whereby different systems of thought could be harmonized based on shared elements of truth. Pico asserted that even though Platonism and Christianity had different views, they held some truths in common. An important aspect of Pico’s philosophical thought was his defense of the dignity and liberty of the human being, set forth in On the Dignity of Man (1486). Ficino also declared “wake up yourself! Oh! You are God who took human figure.” Both philosophers resurrected the humanistic views of ancient Greece. However, the humanism of the Renaissance was more individualistic than the humanism of ancient times. In the Oration on the Dignity of Man (1486), Pico justifies the importance of the human quest for knowledge within a neo-Platonic framework. He writes that after God had created all creatures, God conceived of the desire for another, sentient being who would appreciate all God’s works, but there was no longer any room in the chain of being; all the possible slots from angels to worms had been filled. So, God created man such that he had no specific slot in the chain. Instead, men were capable of learning from and imitating any existing creature. When man philosophizes, he ascends the chain of being towards the angels, and communion with God. When he fails to exercise his intellect, he vegetates. Pico did not fail to notice that this system made philosophers like himself among the most dignified human creatures. The idea that men could ascend the chain of being through the exercise of their intellectual capacities was a profound endorsement of the dignity of human existence in this earthly life. The root of this dignity lay in his assertion that only human beings could change themselves through their own free will, whereas all other changes in nature were the result of some outside force acting on whatever it was that underwent change. He observed from history that philosophies and institutions were always in a state of change, making man's capacity for self-transformation the only constant. Coupled with his belief that all of creation constitutes a symbolic reflection of the divinity of God, Pico's philosophies had a profound influence on the arts, helping to elevate writers and painters from their medieval role as mere artisans to the Renaissance ideal of the artist as genius. A portion of his Disputationes adversus astrologiam divinatricem was published in Bologna after his death. In this book Pico presents arguments against the practice of astrology that have had enormous resonance for centuries, up to our own time. Disputationes is influenced by the arguments against astrology espoused by one of his intellectual heroes, Augustine of Hippo, and also by ideas held by his teacher, Marsilio Ficino, who may have encouraged him to write it. Pico’s antagonism to astrology seems to derive mainly from the conflict of astrology with Christian notions of free will. But Pico’s arguments moved beyond the objections of Ficino (who was himself an astrologer). The manuscript was edited for publication after Pico’s death by his nephew, an ardent follower of Savonarola, and may possibly have been amended to be more forcefully critical. This might possibly explain the fact that Ficino championed the manuscript and enthusiastically endorsed it before its publication. Pico’s Heptaplus, a mystico-allegorical exposition of the creation according to the seven Biblical senses, elaborates on his idea that different religions and traditions describe the same God. De ente et uno, has explanations of several passages in Moses, Plato and Aristotle. Besides the writings already mentioned, see his complete works (Bologna, 1496; Venice, 1498; Strasburg, 1504; Basle, 1557, 1573, 1601). He wrote in Italian an imitation of Plato's Symposium. His letters (Aureae ad familiares epistolae, Paris, 1499) are important for the history of contemporary thought. The many editions of his entire works in the sixteenth century sufficiently prove his influence. Busi, Giulio, et al. The Great Parchment: Flavius Mithridates' Latin Translation, the Hebrew Text, and an English Version (The Kabbalistic Library of Giovanni Pico della Mirandola, Volume 1). Nino Aragno Editore, 2004. Cassirer, Ernst, Oskar Paul Kristeller and John Herman Randall, Jr. The Renaissance Philosophy of Man. Chicago: The University of Chicago Press, 1948. Farmer, Stephen A. Syncretism in the West: Pico's 900 Theses (1486): The Evolution of Traditional Religious and Philosophical Systems. Renaissance Tapes, 1998. Kristeller, Paul Oskar. Eight Philosophers of the Italian Renaissance. Stanford, CA: Stanford University Press, 1964. Includes the complete Oration on the Dignity of Man. Pico Della Mirandola: Of Being and Unity (Medieval Philosophical Texts in Translation, No. 3). Milwaukee, WI: Marquette University Press, 1943. Pater, Walter. The Renaissance. New York: Modern Library, 1871. Wallis, Charles Glenn. Giovanni Pico Della Mirandola: The Very Elegant Speech on the Dignity of Man. Whitefish, MT: Kessinger Publishing, 2004. History of "Giovanni Pico della Mirandola"
This page was last modified on 22 June 2017, at 20:45.